martin joly New theme2018-01-30T20:05:26+08:00 Topic Tags: Buy a new theme, Several questions, and Zimag. This topic contains 11 replies, has 2 voices, and was last updated by martin joly 1 year, 2 months ago. 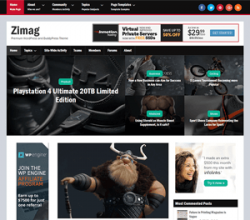 I prefer the Zimag theme than the other, but I would like to know if I have to buy Zimag to have a support that I need to customize this theme. Because I have a lot of questions about Zimag.